A Brill full open access journal dedicated to the descriptive and theoretical study of the Greek language. 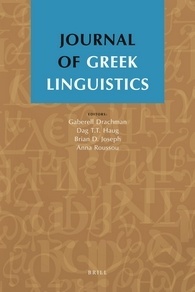 The Journal of Greek Linguistics (JGL) is an established (double-blind) peer-reviewed international journal dedicated to the descriptive and theoretical study of the Greek language from its roots in Ancient Greek down to present-day dialects and varieties, including those spoken in Asia Minor, Cyprus, Tsakonia, and the Greek diaspora. It aims to offer a focused outlet for publication of first-class research in Greek Linguistics, broadly construed. JGL’s goal is not only to reach linguists interested in the Greek language but also to engage the linguistics community and Hellenists more generally. The input to JGL will thus comprise any topic relevant to Greek linguistics, in the broadest sense, but with some preference given to material with wider relevance to specific subfields within linguistics proper. The intention is therefore on the one hand to encourage discussions and research that illuminate different aspects - theoretical, historical, and descriptive - of general linguistics using Greek data, and on the other hand to offer innovative solutions to problems and issues specific to the description and analysis of the Greek language. Greek has played a central role in linguistics and the study of language for centuries. JGL will bring the language into a key position in current debate within Linguistics and related fields. All articles published in the Journal of Greek Linguistics are available in Open Access from the date of publication.